Compositional maps clearly showing hydrothermal overgrowth of magmatic muscovite in greisen (granite altered by hydrothermal fluid) of the tintungsten deposit of Panasqueira (Portugal). 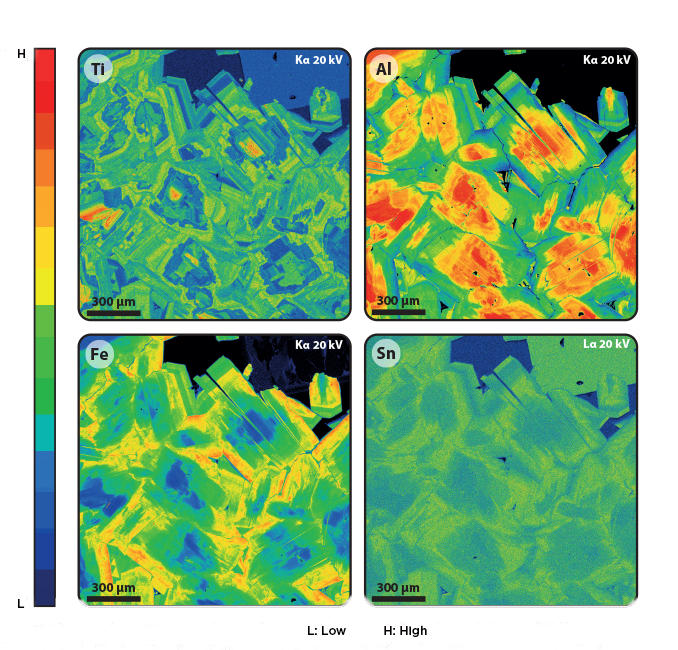 Hydrothermal overgrowths are enriched in tin and iron and depleted in titanium and aluminum. These elemental distributions are consistent with a hydrothermal alteration induced by the circulation of a tin rich fluid. Study conducted with SXFive Electron Probe Microanalyzer. Image submitted by Gaëtan Launay and Ida Di Carlo, University of Orléans, France.